~ about quite a lot. My rules … I must have played the game a lot. This is really a favourites list, these aren’t the necessarily the “best” games. OK. Having started this, I’m now going to change it. It will now be several Vic 20 Top 5’s. Why? This was one of the last Vic 20 games that I purchased and I hadn’t previously played a game by Atarisoft on the Vic, so it was a something of a shock to discover possibly the best “sprite” handling in any Vic game. 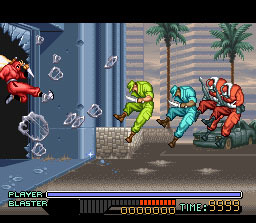 The game plays quickly and feels smooth and “arcadey”. There is almost none of the usual colour-clash on show. There are 6 (I think) different level layouts and even the sounds add to the arcade-like feel. A really really impressive effort — hard, fair, unforgiving, and playable. If you have a Vic, track this huge purple box down. The game starts with 3 enemy rats, 10 bits of cheese, several static cats, a maze, and a radar. The radar shows the location of the cheese and the enemy rats, but not the static cats or the maze itself. Your objective is to eat the cheese and avoid death. Subsequent levels add new mazes and extra rats. There are even “speed run” levels where you have a small amount of time to eat the cheese without moving enemies … not as easy as it may sound. You only defence is a “sparkle fart” which disorientates any chasing rats that fly into it. Lots of fun, and even the girls enjoyed it, but it was too hard for them to complete a level. 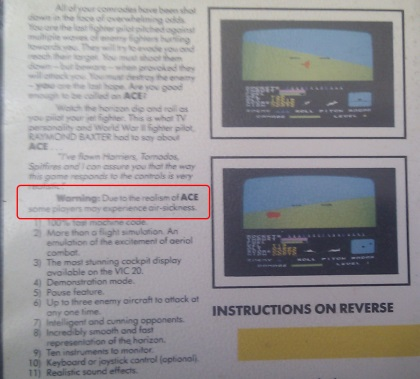 One of the few “arcade conversions” on the Vic and, like Donkey Kong, you can’t expect too much more from the Vic 20. 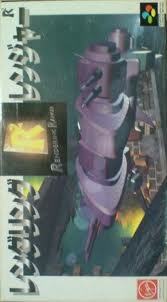 4 levels, each involving your flying a ship and shooting upwards. It’s like Space Invaders with a few funny levels. Even a boss – Flag Ship – on levels 4, 8, 12 etc. 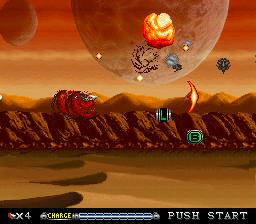 For its time an advanced shoot ‘em up and a game at least partly responsible for my love of the genre. And it is “frog” spelled backwards. And, in the arcade version, if you listened carefully, the speech was poor enough to announce loudly “insert groin”. Coins work better, I assure you. A mildly curious shooter where your score is in the centre of the screen and all the action happens around it. Other than that twist, this is basically Asteroids. Where it scores heavily though, is in terms of playability and replay-ability. It’s one of those games where you die and you know it was your fault, and that makes you want to play it again. 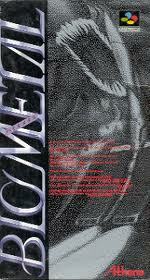 In fact, I played this more times in succession than I did any other Vic game mentioned in this blog. The graphics deserve a mention too, while simple in terms of colour and content, they move very smoothly which is essential of a game that relies on precise play. Worth the £3.99 I paid even now … would make a genuinely fun HD upgrade. Where are Bally Midway now?! 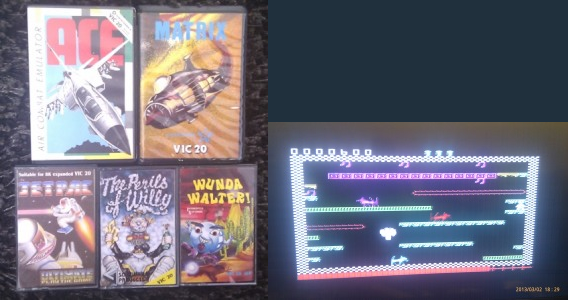 The first four cartridge games that I have mentioned are a clear cut above these two and the rest of my cart collection. Choosing the 5th game was tricky so I copped out and chose two. Cosmic Cruncher is a playable enough pac-man clone with a few levels and no obvious flaws. Its rival is Sargon Chess 2. This is quite special really, a fully AI chess program in such a tiny amount of memory that beat me. I’m not great at chess, but I can often beat the easiest level or two. So worthy of a mention in terms of impressiveness. In fact sod it, don’t even look at Cosmic Cruncher, get Sargon Chess 2 instead. 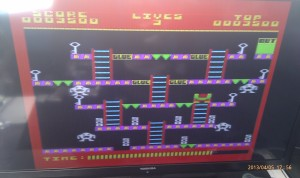 This is Manic Miner with 33 levels. By that, I mean that you must complete one level to progress to the next – in Jet Set Willy, you could go where you wished (skills permitting). 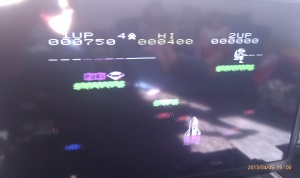 For the humble Vic 20 the graphics are OK, picture a chunked up, fatter, version of the Spectrum. None of the levels featured in the actual Manic Miner; I guess with the resolution being so much lower it simply could be done with any degree of accuracy. And accuracy is the operative word with any of the Miner Willy games – pixel perfect jumping has to be mastered. This is a flawless version of a timeless class, as good as ever it could have been. But rusty nail hard … I never did manage to get further than the first dozen or so levels – and that took some doing! Parallax scrolling. Crazy fast game, fairly tough to grasp, but rewarding and fun. The premise is simple, you control a fat balloon-type creature named in the title, and you hold the fire button to rise, and release it to fall. You may move left and right while the screen automatically scrolls horizontally. There are pellets to collect, on the ground, but while the main aim is survival you don’t progress until you’ve collected enough pellets. There are four “zones” and then the game wraps, standard fare for a game of this era. While the Vic 20 may have a horribly low resolution, its CPU can whip along rapidly enough which is needed in this game as the software sprites rip about. 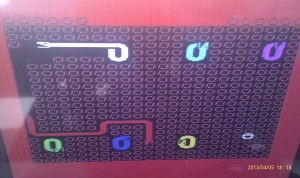 There is colour-clash that the Speccy version is jealous of, but when the game plays this well it is easily forgiven. Another quality game from the past that still plays well today. Though the 16k Spectrum bad boy featured 8 different levels, the lowly 11.5K version only had 4. I have no idea why they didn’t opt for all 8 levels and make it a 16K game. Time pressure maybe, who knows? Anyway, it’s a pity as it’s the only slight downer of an otherwise fine conversion. Go Vic20!!! Really?! That’s what it says on the back of the box! Unbelievable – well, maybe not, but certainly daft. This gets a special mention in part because the task taken on board is so stupidly difficult. Build a (bare bones) flight sim into a machine with less memory than a modern toaster. And less graphical prowess than a fridge. 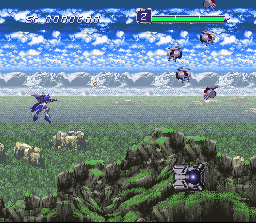 OK, so viewing the enemy planes won’t scare you and the explosions don’t fill the screen with pain. But hey, you can pitch & roll, and fire at stuff that you hardly ever see. I guess in some respects it is more realistic than some modern easy games! To get anywhere near what they did with this game is stunning. I salute them and you should too. Be impressed not by the games, but by how good the games are given the constraints of the hardware. Oh, Geoff Minter. This is Gridrunner’s big brother. The unexpanded game (mentioned below) returns but with more variety, crazy bonus levels, and camels. The extra 8K gave Geoff the chance to turn a simple classic into a bigger and better game. Everything still feels tight and correct, there’s just more to do. 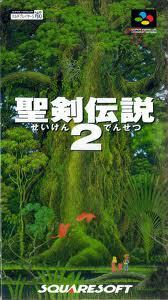 A perfect sequel, not too much changes, but clear improvements are there. Come on! Death race, possibly, has you gasping at the screen shot. But don’t worry, those houses don’t whizz smoothly by, or even move. That said, this game is fun and a great effort. There is a genuine feeling of speed and there are precious few attempts at a racing game of any kind on the Vic. Well played them folks at Atlantis! 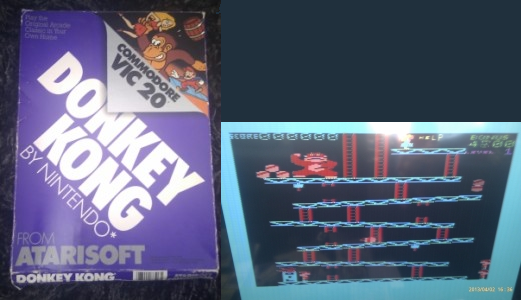 Now Kong, by contrast, is a game type that has many clones on the Vic. And this is one of the few that uses 16K. And it plays like a spiteful warthog. How they could make it so bad when companies like Atarisoft show such quality with their cart?! From memory, these are the contenders, the games that I expect to come out on top. The tides of time will surely have changed things, won’t they?! Not to be confused with Megaman (or Rockman) on the NES. While this is a rip off, it rips off Boulderdash and does it rather well. The game instantly gets kudos for the impressive full-screen mode, and the large number of levels (twenty, I think). You need to get the diamonds, but rocks fall once there is space under them. 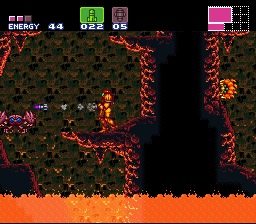 You can push rocks onto monsters to kill them, which is a lot harder than it sounds – the whole game plays very quickly. A tremendous challenge to clear even a few levels, and a truly astonishing game to fit in 3583 bytes! Geoff Minter. Fast stuff. There’s a grid. There are things on it. And there’s plenty of shooting. It’s great. 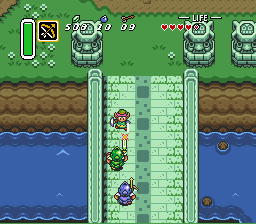 Really fast, really simple – just the way great old games should be. Move about, dodge, shoot all the enemies. It’s pure blasting fun. And there are only so many times I will repeat myself. A cracking title. Like Rockman, same programmers I’d guess, it uses a lovely full screen mode. Also, it features about 20 levels. RIP is much easier to play though. Run round the levels, nap the diamond on each map, shoot the monsters. The diamond appears randomly, so on occasion it is impossible to reach — not to worry, exit the level and re-enter it. Fast and fun. Another great title from Mastertronic. Yet another Donkey Kong clone. You know, ladders and a few collectables. OK, there are no barrels, but hey, it looks like there should be. Now that’s out of the way, the game is really great. Full-screen is used, but only for time and score, and all animation is smooth and it feels very much a polished, well produced title. Collect the keys, jump the gaps, dodge the beasts, beware of glue (it sticks you for a scary second or two) and exit at the door. 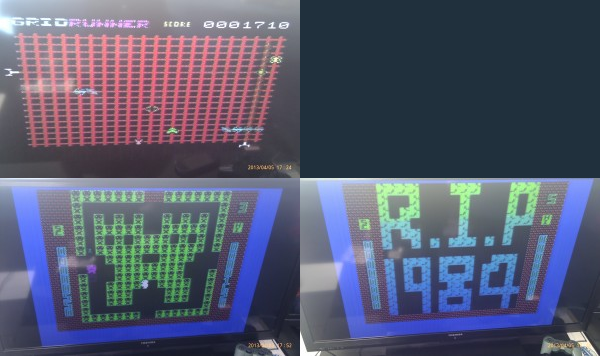 4 levels, and a we have another winner from Mastertronic. The best Vic-20 loading screen ever made is shown above. Seriously – there aren’t many to choose from. This is a two-screen game where you have to get a key, and return to the start. But these are complex levels with a lot going on, and the size of the game can be forgiven. What there is, is very well put together and the whole game feels right. It’s the kind of design that could have made the world’s greatest LCD game. Very much recommended. Oh man, I remember ACHING for this game back in the day. 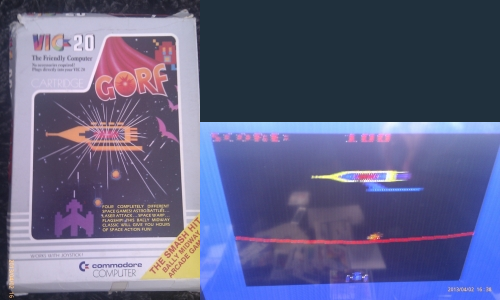 The box cover was so damn cool and it was by Software Projects (the Manic Miner / Jet Set Willy people) so my desire was burning strong. Oddly, I couldn’t remember anything about the game. So, with curiosity, I loaded it up. Oh dear. I wondered if it had worked. It is as mess. Imagine a game written by Geoff Minter’s drunk uncle, that was then butchered as a squadron of cats trampled over his keyboard as he worked. He didn’t care though, the game appeared to almost work. Scrolling from left to right, you have to randomly shoot before almost randomly dying. Yey. Not. Screen-shots not included as I was hurting too much. Or something. Hey, it’s Pac-Man. Without a maze. Yes. Er … what? Ok .. you’re the smiley face and you must eat all the eggs without getting eaten by the snakes. But the snakes are trapped, they can’t eat the eggs. Oh, except the red one. That one will eat eggs, eat you, and free other snakes. When you do managed to clear the eggs, the fun starts. You get to eat the snakes … from the tail end. This bit is really great. Proper fun and dangerous, like any well honed bonus stage. Also, this game has the C64 version on the other side! A cool bonus, if only more games today offered multi-platform-versions. A cool game, not flawed in any way, just not great. These two games are a little odd. They come in big boxes, feature a wild turbo load, claim to run on the unexpanded Vic-20, but only worked when I plugged extra memory in. Weird indeed. A bit of a Robotron clone, shoot the monsters, grab the items and proceed through the levels. What strike you right away is the polish here, the sprites move smoothly, don’t clash horribly, collide accurately and everything works well. Good game design, solid and very clever code is on display. A great achievement. The platform game to make you realise just how bad Cave Fighter is. Again, great sprite work in evidence here, superb collision and movement. Lots of levels, good layout – but unforgiving at times. Very polished, and if you prefer jumping to shooting, you might like it more than Shamus, but I doubt it. So there you go ..
You’ve read my STUPIDLY long Vic 20 nostalgia trip that took almost as long to write as some of the games did to load! Please chat, insult, and engage. Top 10 SNES // SFC Games I *NEED* to play! 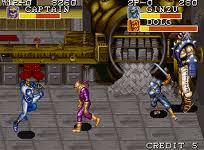 Back in the day, I owned a Megadrive and a PC Engine, so owning a SNES too was out of my financial range. Because I didn’t get my own SFC until I was older (and my early SNES time was on mate’s consoles) my game knowledge on this delightful machine has some rather curious, and large, gaps. A crazy-looking apparently superb hack & slash platformer. Boxed it is stupidly expensive, I aim to find an unboxed copy. 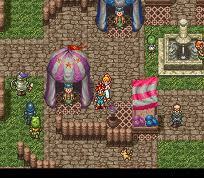 It is supposed to be a brilliant, but the emulator I tried wasn’t perfect, however, I saw enough to start lusting! 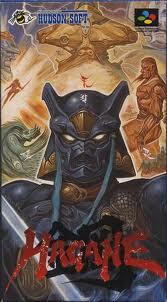 I do like Ninja Warriors. It is a lot of fun. I adored the music on the Amiga version, I still listen to it on my phone. This version is supposed to be the bees knees. I gather those are good, but I’ve yet to encounter them. This omission of mine is indefensible. 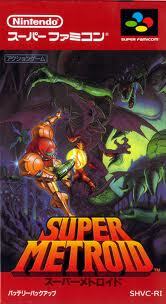 I don’t really know how I’ve managed to avoid it, or why I’ve not properly played a Metroid game on any console. There are reasons that I missed this game and the two that follow. You can’t as easily play RPGs on a mate’s console, I was getting all my RPG fixes on my Megadrive, and I preferred turn-based or strategy (grid-based) RPGs. Now, given that I’ve owned this title for ~20 years, I really should shut up, stop writing this crap, and play the game! Have you ever heard of this game? I had the GB original, and I never really got on with it. Fearing the same, I never got around to playing this version, even though I’ve owned it for 20 odd years, yeah just like S’o’Mana. I love a shooter, me. 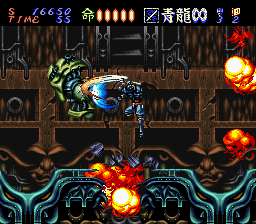 And until recently I had no idea that the superb PC Engine blaster had this sequel. I must know more. But it is a shooter and therefore horribly expensive … but not quite out of reach! 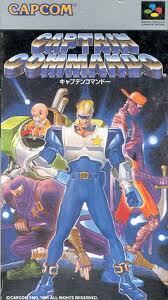 I’m also a sucker for a good scrolling fighter and Capcom rocked on the SFC. I never found this in the arcade, so now the time is right for me to correct half a life time of missing out. The graphics look, big, bold and colourful. I want. This looks like a tech demo with all sorts of crazy parallax effects and giant sprites. 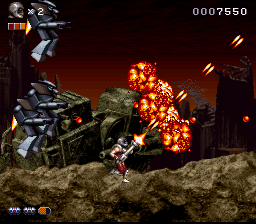 But it also looks like a Turrican beater, and Turrican gets a mention further down. 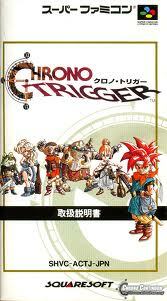 I yearn to know more about this game which came along late in the day for the SNES. I want to play it with a proper pad (a memory from a very brief emulation session). Yes, another shooter that slipped me by. I gather it isn’t the very best either. But, and this is the twist, it contains the 2-Unlimited “song” Get Ready For This. How can I resist the urge to shoot and rave at the same time?! I can’t … can you?! Oh, Ray & Anita, where are you now? Axelay: a shooter, I have played it, but not properly & not in many years. Rushing Beat: a scrolling scrapper, rumoured to be excellent, with the sequels even better. Secret of Evermore: a fourth (action) RPG that I own and have not play. Looks absolutely gorgeous. Sword Maniac: a hack & slash platformer. More affordable than Hagane, so I might play this one sooner! Super Turrican: I’ve never played a Turrican properly either, but they do look good, and the musician is world class (Chris Husslebeck, sorry for the spelling). We’ve all heard that Super Grafx verison (on a 1024Kb card) has superior graphics and that the Megadrive version (on a 640kb card) has better sound. But let us check out the graphics in more detail and see how they play. 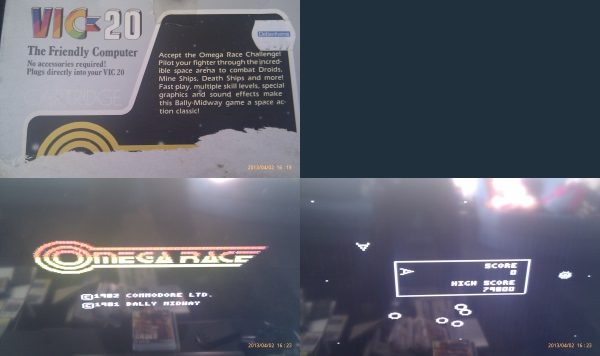 Below the Megadrive (MD) screen shot is on the left, and the Super Grafx (SG) is on the right. The TV in the middle annoyed me, so you can share my mild pain. Much better background tree movement on the SG, the rain looks better in screen shots on the MD version, but it mainly flickers on and off, whereas the SG version falls more like rain does. The trees are more detailed on the SG. Oh, even the grass moves in the SG version, a lovely touch. Shots like this really make the MD version look shamefully lazy; next to no detail on the floors and walls. Awful really … one must consider the memory size limitation on the MD cart, and that it was released very early in the life of the MD. Not an excuse; maybe an explanation. The pigs themselves are pretty much identical, but the inferior detail in the background of MD version sticks out like two sore thumbs. The SG version boss kind of smokes into life, the MD one arrives fully assembled. The MD boss has more shades of colour, but both are big, bold, and bloody dangerous. Again there is evidence of background sparcity on the MD. Level 2 contains the same old story, I’m afraid. The MD sprites are easily the equal to those on the SG, but the wind-mills look like they’ve been cut out of cardboard and stuck on by a 3 year old. The smoke is nicely animated on the SG version too (missing on the MD) and the floor is nicely detailed; the blue splodge on the MD version looks like a pile of rocks. I really didn’t realise just how inferior the background details were. The sound is actually very good on the SG on this level. For me, playability was identical – fantastic on both. I’m surprised by how much better the details are on the SG, and I think that the difference in sound quality is far smaller and easier to cope with than the graphical blunders of the MD. However, none of that matters unless I can get more than 3 continues on the SG! It is a fantastic game, but totally unforgiving – even when you’ve played it a lot! Just be sure to have one verion, and if you’re lucky enough to have a Super Grafx, you’d better get that one. 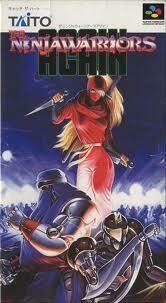 Megadrive owners needn’t grieve though, they’ll get to see much more of the game with all of those continues!